I used to sing The Castle of Dromore to little Bridget as I rocked her. She was a child that Dan and I fostered who was just ten months old when we got her. Her birth mother was a 16 year old, addicted and unable to care for the child. Hush a bye loo, lo loo. The song sustains some haunting themes as it describes the October winds lamenting around the castle with its lofty halls. It also speaks of dread spirits over the Black Water with a banshee (profit of death) screaming, and a mother (father) begging the Virgin Mary for pity and protection letting no harm come to "my helpless babe and me." In the end, the verses tell the child to take time to thrive in the gardens of Dromore for now is the time to rest. Later there will be plenty of work to do. The lyrics are said to be written by Harold Boulton, (lyric writer of Skye Boat Song) who visited the Castle of Dromore in the first years o the twentieth century. He was evidently a friend of Harold Mahony, Olympic silver medalist and Wimbledon Champion and the last Mahony male to own the Castle of Dromore. After his untimely death in a bicycle accident in 1905, the castle passed into the hands of various relations, none of whom cared much for the castle. Bridget's mother consented to adoption and our large family looked forward to adding a seventh child to our clan. Bridget continued to grow and develop and I continued to sing to her. The Castle of Dromore was a favorite. On June 1, 2000, just before we were to secure the adoption, Bridget's mother withdrew her consent and drove unexpectedly to our home and took the child away with the help of the local police department. Evidently, the mother needed to prove that she had the responsibility of a child to take care of in order to skip being sent to jail on a prostitution and drug charge in Florida. Once they took Bridget across state lines, she was lost to us forever. I couldn't bear to hear the song anymore. But I was still touched by it. The visuals my imagination created as I sang it to Bridget still hung with me and fascinated me. When preparing for this year's trip to Ireland, I knew I'd be travelling to Kerry near the real Castle of Dromore. Though it isn't known as a "thin place" and not on the agenda for my visit, I was curious and hoped I'd be able to see it. I did a little research and found that it was privately owned and being restored. 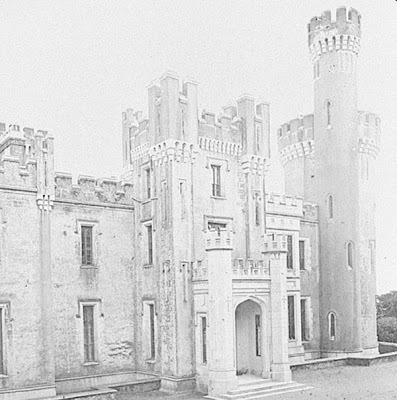 The castle was designed by Cork architect, Sir Thomas Dean and built in 1839 for Denis Mahony, grandfather of Harold (tennis player). Denis was a minister for the Church of Ireland who operated a soup kitchen at the castle during the potato famine. 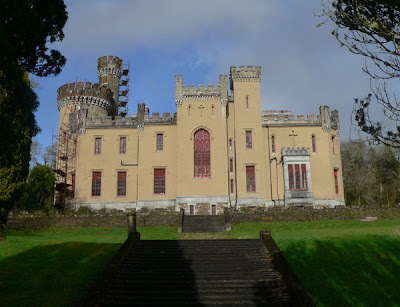 I found information on the location of the Castle on the Internet and tucked it away in case I had time for a short visit while I was in the Kerry / West Cork region. It wasn't too far out of my way. I turned off the main road at the castle gatehouse - also designed by Sir Thomas Dean - and followed the roads to the Castle. The signage warned that it was private property so I was reluctant to approach. 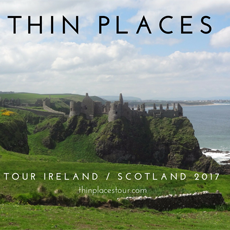 I decided to offer the owner or resident my business card with my outline of the Thin Places project and ask permission to view the grounds - in hope of including the Castle in the book. The owner wasn't on site, but the superintendent overseeing the renovations was present and agreed to allow me to look around and take a few pictures once I presented my card and outline. I was grateful. The renovations being done are remarkable and extensive. The castle sits high on a hill overlooking the Kenmare river with a terraced lawn and stone steps leading down to the river. An arched window dominates the south face of the castle. The gardens of Dromore are behind the castle. The bones of an orchard, terraced gardens and stone buildings still remain within the garden walls. It's easy to see why Boulton would write - take time to thrive, my ray of hope, in the gardens of Dromore. You can imagine theses gardens in their day of walled protection being a safe haven, always ripe with new discoveries for children. When I made my last round of the property, I noticed the old tennis court. 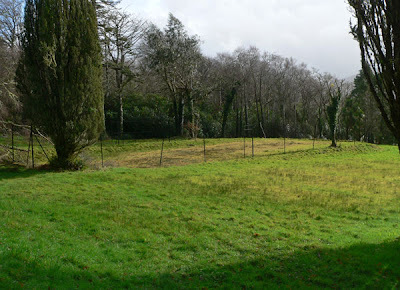 I had read in my Internet research that Harold Mahony's tennis court was in the area of the gardens - but it isn't. 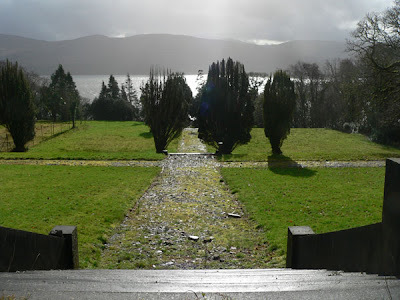 The old tennis court (now unused for 100 years) overlooks the Kenmare river. It's ever so subtle - grown over with grass blending into the rolling, terraced lawn. A great sadness came over me as I past it. I felt tears come into my eyes and I couldn't understand why ... I still don't know really, but I know I was close to something... something sad. The Castle of Dromore is a thin place - though a privately owned one, and I don't recommend others trespass or intrude upon the owner's private quarters. 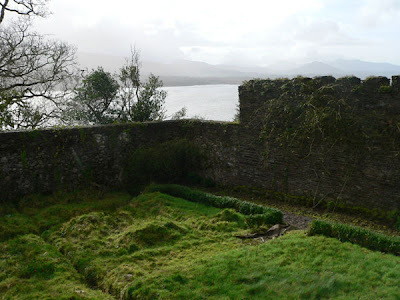 The castle can be seen well from the Kenmare River, and I hope the owner isn't offended by my discussing his property publicly in this blog. On June 1, 2005 I witnesses the births of my twin granddaughters Mia and Grace. They were born exactly five years (to the day) after Bridget left us. I'm back to singing and rocking - this time twice as much - and yes, I'm singing The Castle of Dromore to these little girls. It doesn't hurt anymore. I'll never forget Bridget or stop loving her, but Mia and Grace have made remembering her easier. I'm glad Harold Boulton visited Harold Mahony at the Castle of Dromore - and glad he wrote those lyrics. I wonder if he imagined how far his simple verses would reach or how many he would touch - children, mothers, lovers of Irish music? I'm glad that Bridget made the song come alive for me, and glad that images the song burned in my imagination led me to visit the Castle and led me to write about it here. The pictures will be something I can show Mia and Grace when they get a little older and tell them how I've been to the real Castle of Dromore. We stumbled upon the castle during a hike along the Kerry Way today. Thank you digging into its history and posting it on your blog. We also loved your photo of the stone circle at nearby Gleninchaquin Park. You are most welcome. Glad someone else was able to see this site and share back with me how it felt. I still think those grounds are magical. Enjoy your hiking in those very thin places. There are three Dromore Castles in Ireland (Co. Kerry, Co. Limerick and Co. Tyrone). I believe that the song was written about the Co. Tyrone version of the castle. The second verse starts with "Dread spirits over the of black water, Clan Owen's wild banshee". There is a river called the Blackwater in Tyrone and also the name Tyrone comes from the Irish 'Tír Eoín' - literally Eoin/Owen's country. True. However there is also a Blackwater area near the Dromore Castle in Kerry. Secondly, it is likely that the lyrics were written by Harold Boulton who was a friend of the tennis player, Mahony who owned Dromore Castle in Kerry. Lastly, if you wander through the old gardens on the estate, you are immediately joined by the lyrics "take time to thrive my ray of hope in the gardens of Dromore." The gardens are all still walled with gated entrances. Perfect location to have a child safely play outside. I was aware of the other locations before I wrote the post. After investigating, the only link I could find to the Tyrone castle was the Owen / Blackwater reference. Though it's compelling, the Boulton tie and the fact there the area around the Upper Kenmare River has a Blackwater reference, I'm led to believe the song refers to the Castle in Kerry. 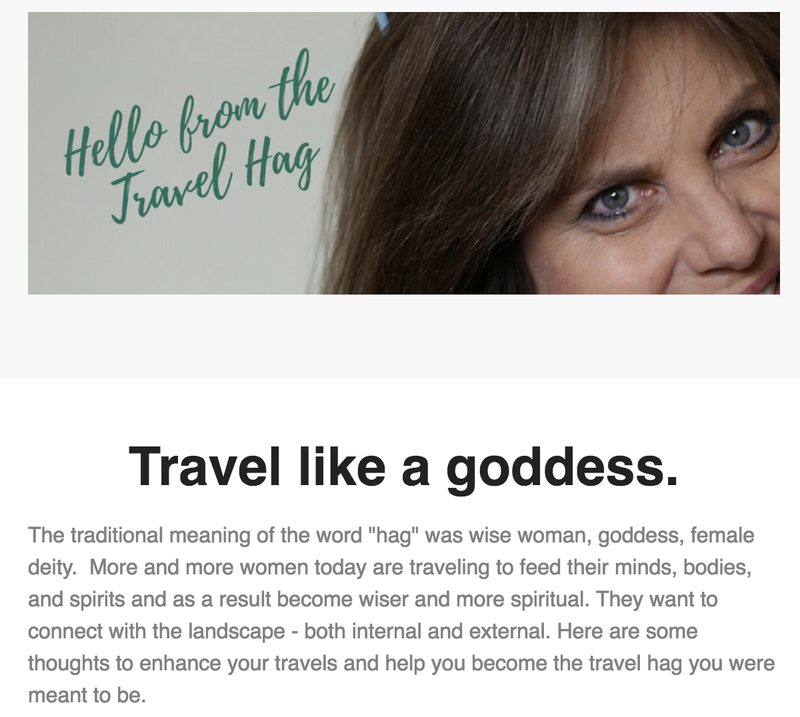 Thanks so much for taking the time to read the post and comment. And thanks for sharing your thoughts on the Tyrone castle.